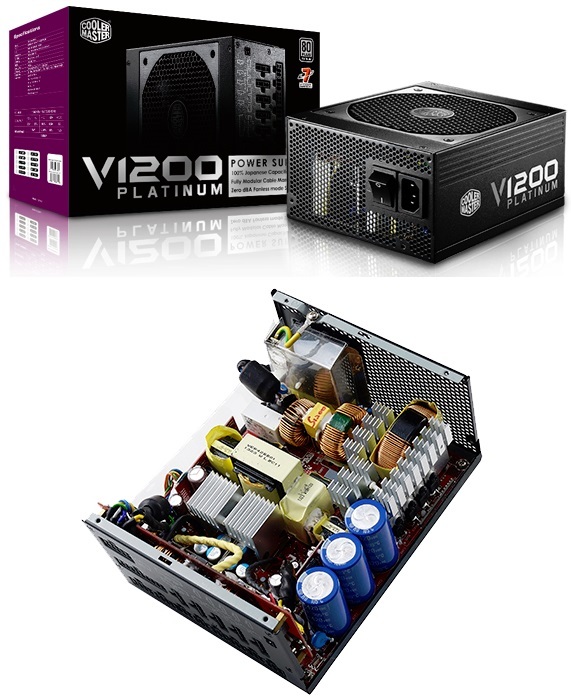 Cooler Master announces the V1200 80 PLUS Platinum Power Supply. The unit is currently available in the CM web store for $299.99. Cooler Master, a leading creator, innovator, and manufacturer of desktop components and peripherals as well as mobile accessories today announced the V1200 80 PLUS Platinum Power Supply. Complementing the high quality 135mm Fluid Dynamic Bearing (FDB) fan is a new Hybrid Fan Controller that allows you to quickly toggle between an always-on fan mode or zero dBA fanless operation when under 30% load. The fan's bearing type offers superior performance and lower noise levels while far outlasting typical PSU fans. Ultimately, the V1200 is extremely quiet, even when under full load. V1200 is compatible with Intel's 4th Generation Core desktop processors with C6/C7 Power States, allowing the processors to go from C0 (active) to C7 (Deep Power Down), which helps provide maximum power savings. V1200 is immediately available through Cooler Master's CM Store and will be shipping to retailers soon. Please consult your local Cooler Master Representative for more information on pricing and local availability.